At 7 a.m. Central Time on Sunday, October 8, 2017–The National Hurricane Center says Tropical Storm Nate is rapidly weakening, but the storm surge continues. This morning the heavy rainfall is spreading over the southeastern United States. Hurricane Nate made landfall overnight at 12:30 a.m. as a Category 1 hurricane near Biloxi, Mississippi with 85 mph maximum winds. Nate brought storm surge flooding and power outages across Louisiana and the southern Gulf Coast with it. Tropical Storm Nate is 50 miles ESE of Meridian, Mississippi and 95 miles WSW of Montgomery, Alabama. Nate is moving NNE at 23 mph with maximum sustained winds of 45 mph, the NHC says. On the current forecast track, Nate’s center is forecast to move inland across the deep south, Tennessee Valley and central Appalachian Mountains through Monday. A storm surge warning is in effect for Mississippi/Alabama border to the Okaloosa/Walton County Line, Florida. A tropical storm warning is in effect of Alabama/Florida border eastward to Indian Pass, Florida. At 10 a.m. Central Time Saturday, the National Hurricane Center says category 2 Hurricane Nate is strengthening in the Gulf of Mexico. Hurricane Nate is 180 miles SSE of the mouth of the Mississippi River and 265 miles S of Biloxi, Mississippi. Nate is briskly speeding NNW at 26 mph with maximum sustained winds of 90 mph. The hurricane is forecast to make landfall tonight somewhere along the central Gulf coast. A tropical storm warning also has been issued for parts of the Florida panhandle. Nate is forecast to produce 3 to 6 inches of rain, a maximum of 10 inches from east of the Mississippi River from the central Gulf Coast into the Deep South (Tennessee Valley, the southern Appalachians). New Orleans officials ordered a curfew starting at 7 p.m. Saturday ahead of Nate. Voluntary and mandatory evacuations are in effect in Orleans, Jefferson, St. Bernard, Plaquemines, Lafourche and St. John the Baptist parishes. Residents are advised to complete their storm preparations. Local meteorologists also warn of flooding, power outages, dangerous storm surge and wind damage. Tornadoes also are possible with this hurricane. The governors of Louisiana, Mississippi, Alabama and Florida also declared states of emergency. 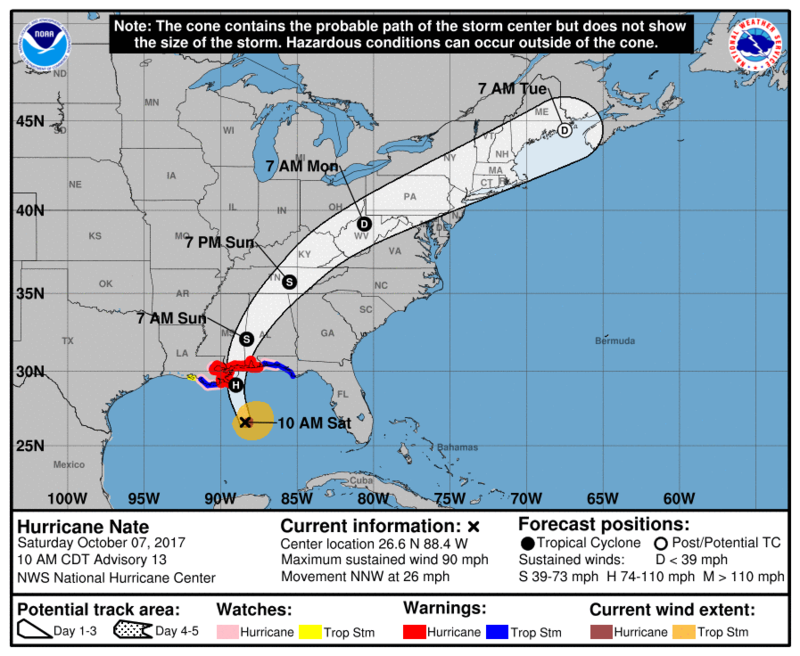 “On the forecast track, the center of Nate will move across the Gulf of Mexico today and will make landfall along the central U.S. Gulf coast tonight.” NHC public advisory stated. Mouth of the Mississippi River to the Alabama/Florida border…7 to 11 ft.
Mississippi/Alabama border to the Alabama border to Alabama/Florida border, including Mobile Bay…6 to 9 ft.
Morgan City, Louisiana to mouth of the Mississippi River….4 to 6 ft.
Alabama/Florida border to Okaloosa/Walton County Line…4 to 6 ft.
Okaloosa/Walton County line to Indian Pass, Florida….2 to 4 ft.
Indian Pass to Crystal River, Florida….1 to 3 ft.
For updates, stay tuned to local broadcast, cable, the National Weather Service, NHC, social media and follow instructions from local government and emergency management officials. This entry was posted in Community Alert, Hurricane Season, National News, News Alert, Weather and tagged Hurricane Nate, National Hurricane Center Nate, NWS Nate. Bookmark the permalink.